Buy 12 or more for only $26.95 each! Note: These are the original Automatic Temp-Vents (Patented in the 60's) All other auto vents are clones of this vent and only have one year warranties, plus the product materials are not of the same quality materials as the original Temp-Vents sold here. 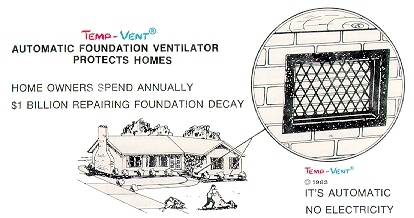 Help protect your foundation with Temp-Vent. The foundation is critical to the integrity of the home. That’s why foundation ventilation is critical. Unventilated foundations are subject to built-up moisture that can eventually lead to costly damage. If there’s one thing termites are attracted to, it’s warm, moist, dead air environments such as those found under houses in crawl spaces or unfinished basements. Temp-Vent foundation vents are designed to provide ventilation that can reduce moisture in these areas, which helps control termites. A crawl space dehumidifier with no drain or power needed! Whenever possible, vents should be placed on all sides of the foundation. This will create an intake/exhaust system that delivers a steady flow of air. One vent should be installed for each 8 to 10 feet of foundation wall. Most building codes require 1 square foot of open ventilation area for every 150 square feet of crawl space. Temp Vent Automatic Foundation Vents have 50 inches of net free area per vent. Therefore, you should install one vent for every 50 square feet of crawl space. For crawl spaces with polyethylene installed, on 80-90% of the ground, the ventilation requirement changes to 1 square foot of ventilation for every 500 square feet of crawl space with a minimum of 4 vents installed to provide cross ventilation. For crawl spaces with polyethylene, install at least one vent for every 500 square feet of crawl space. The non-powered, Automatic Foundation Vent will open and close automatically using a heat/cold sensitive coil. The louvers open completely at approximately 72°F and completely close at approximately 38°F. Unlike manual vents that can waste energy when no one remembers to open or close them, these vents self-adjust all year long. For proper ventilation, one vent should be installed every 8-10 feet. Avoid dead air spaced by placing vents within 3 feet of each corner. A minimum of 4 vents are required to provide cross-ventilation. Dense shrubbery should be trimmed for the vents to be effective. A heavy duty coil for dependable operation. 8"x16" to fit into a standard block opening. A net free area of 50 square inches. The Series 5 vents have a removable front frame (in addition to the removable back) that can be snapped on after installation. Actual dimensions of the vent is 7¾x 15½with a depth of 4 5/8inches. Click the button below to add the Temp Vent Series 5 Automatic Crawl Space Vent to your wish list.